The Seoul Philharmonic Orchestra is taking tangible steps to return to normal after a yearslong struggle. The orchestra will embark Nov. 25 on a tour of five European cities -- Geneva, Udine, Lucerne, Grenoble and Paris -- and will perform at its final stop, Paris, Dec. 1. This is the first European tour for the orchestra in four years, which was left floundering after a bitter controversy over allegations of sexual harassment, abuse and irregularities. 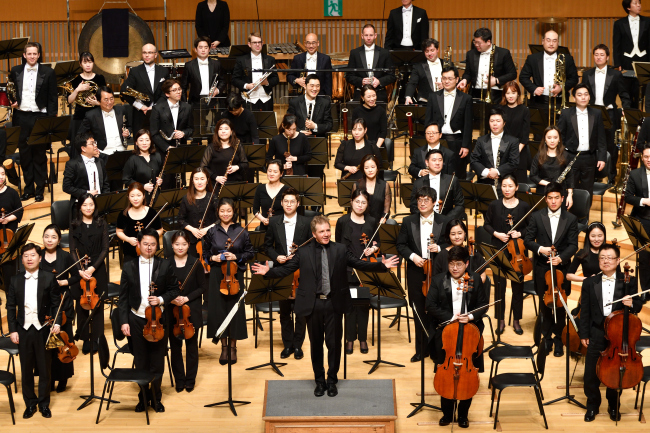 The Seoul-based orchestra has also started the process of appointing an artistic adviser, a position left vacant after the departures of conductor and artistic director Chung Myung-whun at the end of 2015 and artistic adviser Michael Fine, also in 2015. Chin Un-suk, a longtime composer-in-residence, who filled in for Fine as artistic adviser, left the orchestra in January this year. Wolfgang Fink, a veteran artistic administrator from Germany, is to be named its new artistic adviser, the orchestra announced on Monday. The trouble began in 2014 when the orchestra’s CEO, Park Hyun-jung, was accused of abusing her subordinates. She resigned at the end of the year and the orchestra was left deeply damaged as a result of the court battle. In 2015, the orchestra’s seven-city tour of the US, for which tickets had already been sold, was canceled due to budget restrictions. Chung left the orchestra at the end of that year after 10 years as its artistic director, a period that saw the SPO perform overseas, including at the prestigious BBC Proms in 2014, and record albums with Deutsche Grammophon. Thierry Fischer, the principal guest conductor, will lead the tour, and pianist Kim Sun-wook will perform the piano concertos. Meanwhile, the orchestra, headed by Kang Eun-kyung since March, will soon announce a successor to associate conductor Choi Su-yeol, who left in 2017. Fischer and conductor-in-residence Markus Stenz are both signed on until the end of 2019.